Whole grains are not only delicious and nutritious, they contribute to keeping us healthy and protected from chronic health problems. What Is The Definition of Whole Grains? Kernels that contain all the essential parts and naturally-occurring nutrients of the entire grain seed are considered whole. If the grain has been cracked, crushed, rolled, extruded, and/or cooked, the end product should deliver the same rich balance of nutrients that are found in the original grain. Phytochemicals, - Also called phytonutrients - non-nutritive plant chemicals that can protect health and prevent disease. Don't be deceived by the word enriched. What that lofty term actually means is that when grains are refined, approximately 22 natural nutrients are lost when the bran and germ are removed. The resulting white flour is then 'enriched' with 5 or 6 synthetic nutrients. The term enriched wheat flour should truthfully be called denatured low-nutrient flour. Whole grains contain all three parts of the grain - the bran, endosperm, and germ. In addition to tasting delicious, whole grains provide a wide range of nutrients that are missing in refined flour products. The higher the percentage of whole grains in a food, the more health benefits it provides. Wholesome grains contain protective antioxidants in quantities close to or exceeding those in fruits and vegetables. Higher consumption of complete grains is associated with lower BMI (Body Mass Index) and a reduced risk of overweight and obesity. Research indicates that the antioxidants contained in whole grains act with the fiber to lower cholesterol and reduce the risk of high blood pressure, heart disease, and stroke. Consumption of whole cereal grains is associated with slower buildup of artery-narrowing plaque. 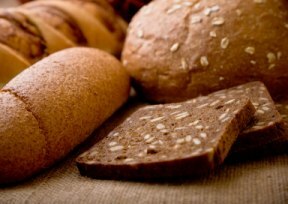 Whole grains appear to play an important role in reducing the risk of colorectal cancer. Eating two servings or more daily may cut the risk of pancreatic cancer. People who eat three or more servings daily, especially from high-fiber cereals, are less likely to develop insulin resistance and metabolic syndrome, precursors of Type 2 diabetes. Fiber assists with bowel regularity by helping to move waste through the intestines and by supporting the growth of healthy intestinal bacteria. Whole grains are beneficial for preventing constipation and also help prevent diverticulosis, which are herniations in the muscular wall of the colon. When possible, choose whole multigrain products to get the benefits of a blend of nutrients. Choosing organic ingredients will further boost the nutrient value. Avoid foods that contain 'wheat flour' or 'enriched flour' as that's just a sneaky way to describe white flour. Chew well to savor the rich, complex flavors of whole grains. Once you get used to eating these grains, products with refined grains will taste bland and wimpy. Amaranth was an important staple of the Aztec culture and has a high level of very complete protein, including the amino acid lysine. Barley is one of the oldest of cultivated grains and has been found in Egyptian tombs. The fiber in barley is especially healthy and may lower cholesterol even more effectively than oat fiber. Buckwheat is the only grain known to have high levels of rutin, an antioxidant that improves circulation and prevents LDL cholesterol from blocking blood vessels. Bulgur is wheat kernels that have been boiled, dried and cracked. It has more fiber than quinoa, oats, millet, buckwheat or corn. Corn has the highest level of antioxidants of any grain or vegetable - almost twice the antioxidant activity of apples. However, since most corn is now genetically modified, it's important to only buy organic corn and corn products. Also, avoid labels that say 'degerminated' as this is no longer a complete grain. Kamut is an heirloom wheat variety and has higher levels of protein and more Vitamin E than common wheat. Millet is a leading staple grain in some parts of the world and has a mild, delicate flavor. Oats contain a special kind of fiber called beta-glucan, which is especially effective in lowering cholesterol. Oats also contain a unique antioxidant that helps protect blood vessels from the damaging effects of LDL cholesterol. Quinoa (keen-wah) is a wonderful grain that was cultivated by the Inca. It is a complete protein that contains all the essential amino acids. Most quinoa should be rinsed before cooking to remove the bitter residue of natural plant-defense saponins. Rice is one of the most easily-digested grains and is often recommended as a baby's first solid food. The germ and bran have been refined out of white rice. Whole grain rice is usually brown, but some varieties are black, red or purple. Rye has a high level of fiber in its endosperm, not just in its bran. For this reason, it promotes a rapid feeling of fullness and is a good choice for people trying to lose weight. Rye also has a lower glycemic index than wheat and most other grains, making it especially healthy for diabetics. Sorghum, also called milo, is a gluten-free grain that is especially preferred by those with celiac disease. Spelt, a variety of wheat, is higher in protein than common wheat. Some people who are sensitive to wheat can tolerate spelt. Teff is a nutritious variety of millet that has over twice the iron of other grains, and three times the calcium. It is a more common grain in Ethiopia, India and Australia. Triticale is a hybrid of durum wheat and rye and is grown mostly in Europe. Wheat contains large amounts of gluten, a stretchy protein that enables bakers to create nicely risen breads. There are two main varieties of wheat; durum wheat is made into pasta and bread wheat is used for most other foods. Hard wheat has more protein, including more gluten, and is used for bread making. Soft wheat is made into 'cake flour' and has a lower protein content. Wild Rice, not a true rice, is actually the seed of an aquatic grass and is most often eaten in a blend with other rices or grains. Wild rice has twice the protein and fiber of brown rice, but contains less iron and calcium. There are millions of people who can't tolerate grains with gluten. Many people have an allergy to wheat, and millions more have a condition known as celiac disease - an autoimmune form of gluten intolerance. A gluten-free diet is also sometimes part of the treatment for autistic children. Even though oats are inherently gluten-free, they are frequently contaminated with wheat during processing. There are some companies, including Bob's Red Mill, that offer pure uncontaminated gluten-free oats.